Hawaiian Airlines on August 13, 2018 celebrated the launch of all-cargo service between Honolulu’s Daniel K. Inouye International Airport (HNL), Līhu‘e Airport (LIH) and Hilo International Airport (ITO) by transporting construction and household supplies to support disaster relief projects in Hanalei on Kaua‘i and Puna on the Island of Hawai‘i. Hawaiian’s new ATR 72 aircraft was loaded with 1,020 pounds of construction tools bound for Līhu‘e to be used by Kaua‘i Habitat for Humanity in repairing homes for low-income residents affected by last April’s devastating storms. A second flight to Hilo carried 1,815 pounds of furniture for 20 micro-houses built by HOPE Services Hawai‘i to shelter families affected by the ongoing Kīlauea volcano lava flow. The items were packed by employees at City Mill, which augmented Hawaiian’s list with its own donations. Also aboard the flight from Honolulu to Hilo were 23 boxes of school supplies collected by Hawaiian employees and being delivered to Pāhoa Elementary. The pictured N810HC below made the first revenue flight. Above Copyright Photo (all others by Hawaiian): Ohana by Hawaiian-Empire Airlines ATR 72-212 (F) N810HC (msn 423) HNL (Ivan K. Nishimura). Image: 943082. 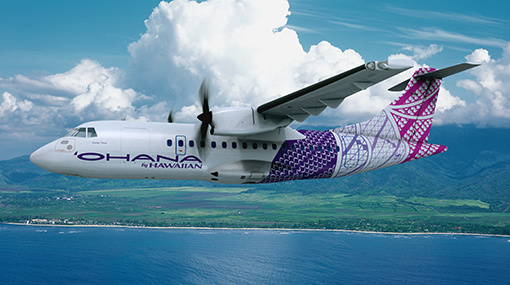 Hawaiian’s new cargo fleet, consisting of two ATR 72 aircraft (N810HC and N811HC) in an all-cargo configuration, offers customers efficient shipment of goods throughout the state with well-timed connections from the airline’s mainland and international networks. The ‘Ohana by Hawaiian freighter operation will also include flights between HNL and Kahului Airport (OGG) and Kona International Airport (KOA) with the arrival of two more aircraft expected to be in service next year. Hawaiian’s ATR 72s can also accommodate up to seven LD-3 containers, the same type carried by aircraft flying Hawaiian’s transpacific routes, allowing the airline to transfer cargo more seamlessly between the islands and destinations in Asia, the South Pacific and the U.S. mainland. The cargo fleet is operated by Empire Airlines, which also operates ‘Ohana by Hawaiian’s four 48-passenger ATR 42 fleet serving the communities of Kapalua (Maui), Moloka‘i and Lāna‘i. The new ATR 72 service complements bulk freight and containerized shipping Hawaiian provides on over 70 scheduled transpacific daily flights with Airbus A330 and A321neo, and Boeing 767 aircraft. The airline’s Boeing 717 fleet, which flies approximately 170 daily flights between the Neighbor Islands, will continue to provide express shipments throughout the state. Hawaiian Airlines became the first U.S. carrier to obtain a cargo certificate on March 20, 1942, when it converted amphibious Sikorsky S-38s into cargo aircraft to transport beef from Moloka‘i to Honolulu, while using S-43s as freighters servicing other islands. Hawaiian has provided transpacific shipping for over 75 years. This entry was posted in Empire Airlines (Idaho) (3rd), Hawaiian Airlines, Ohana by Hawaiian and tagged ATR 72-212 (F), Hawaiian Airlines, HNL, msn 423, N810HC, Ohana by Hawaiian-Empire Airlines on August 14, 2018 by Bruce Drum. Hawaiian Holdings, Inc., the parent of Hawaiian Airlines, has agreed to purchase the AOC and other assets of bankrupt Island Air for $750,000. According to Honoluu Star Advertiser, the decision to acquire the AOC will allow ‘Ohana for Hawaiian to become a stand alone airline subsidiary. Curently, the three ‘Ohana ATR 42-500s are operated under contract by Empire Airlines. 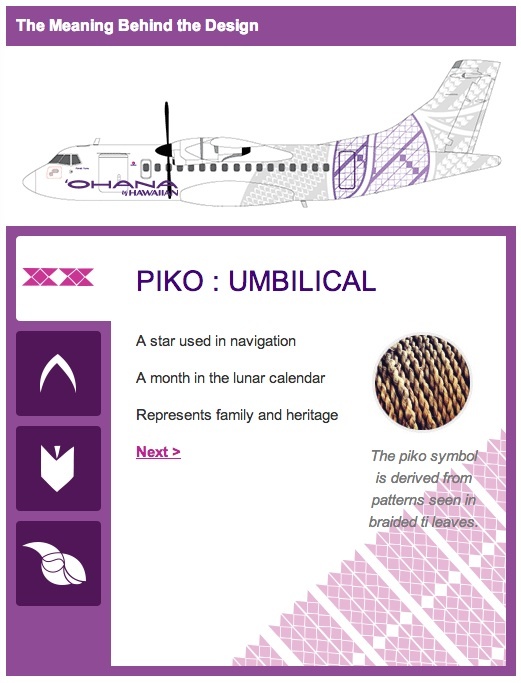 The ‘Ohana turboprop aircraft features a livery designed by Hilo-based artist Sig Zane and his son Kūha’o. 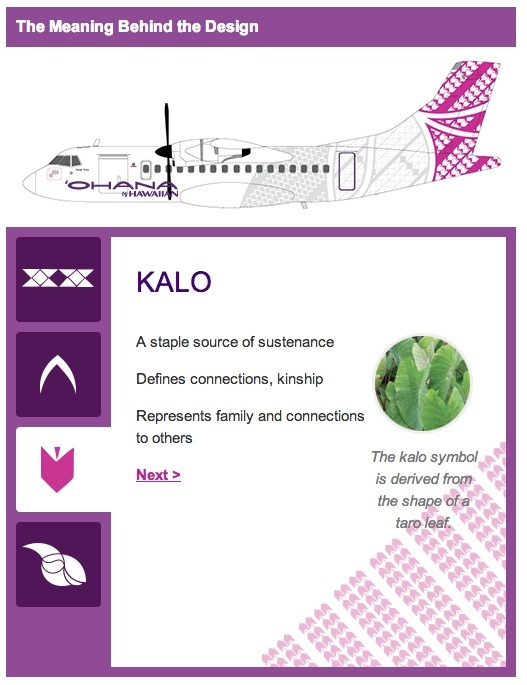 The aircraft are named after a significant wind on each of the islands that `Ohana by Hawaiian serves: Holo Kaomi of Paomaʻi, Lāna’i; Kaiāulu of Wai’anae, O’ahu; and Hikipua of Hālawa, Moloka’i. 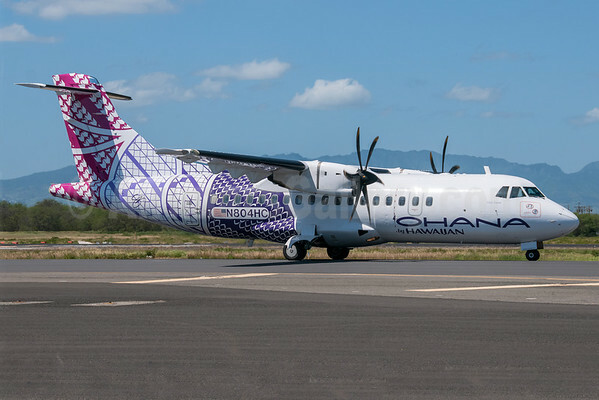 Copyright Photo: Ohana by Hawaiian-Empire Airlines ATR 42-500 N804HC (msn 623) HNL (Ivan K. Nishimura). Image: 922268. This entry was posted in Empire Airlines (Idaho) (3rd), Hawaiian Airlines, Hawaiian Holdings, Ohana by Hawaiian and tagged ATR 42-500, Hawaiian Holdings, msn 623, N804HC, Ohana by Hawaiian-Empire Airlines on December 22, 2017 by Bruce Drum. ‘Ohana by Hawaiian (Honolulu) yesterday (March 18) launched its inaugural flight to Lana’i, the second of two islands it has returned to the Hawaiian Airlines network. The Lana’i service will operate twice daily using a 48-seat ATR 42 aircraft operated by Empire Airlines (Idaho). Last week, ‘Ohana by Hawaiian also launched thrice-daily service between Honolulu and Moloka’i. The departure of Flight HA 612 to Lana’i Airport was preceded by remarks from Hawaiian Airlines Executive Vice President and Chief Commercial Officer Peter Ingram, followed by a traditional Hawaiian blessing at the gate. Copyright Photo: Ivan K. Nishimura/Blue Wave Group. ATR 42-500 N804HC (msn 623) operated by Empire Airlines taxies at Honolulu. This entry was posted in Empire Airlines (Idaho) (3rd), Ohana by Hawaiian and tagged 623, ATR, ATR 42, ATR 42-500, empire airlines, Empire Airlines (Idaho) (3rd), Hawaiian Airlines, HNL, Honolulu, Lana'i Airport, Lanai, N804HC, Ohana, Ohana by Hawaiian on March 19, 2014 by Bruce Drum. ‘Ohana by Hawaiian (Honolulu), Hawai’i’s newest interisland operation, yesterday (March 11) launched its inaugural turboprop service to Moloka’i, the first of two islands it will return to the Hawaiian Airlines network. Twice daily service between Honolulu and Lana’i will be launched on March 18. The arrival of flight HA 614 into Moloka’i Airport was followed by a cultural exchange featuring an oli kahea (chant of admission) presented by Hawaiian Airlines and ‘Ohana by Hawaiian staff asking for permission to enter the community, and an oli aloha (chant of welcome) from the Hawaiian language immersion students of Punana Leo o Moloka’i and ‘O Hina i ka Malama, and the seniors of Alu Like, Inc.’s Ke Ola Pono No Na Kupuna. Remarks were given by renowned Hilo-based artist Sig Zane, who designed the livery of the aircraft; Tim Komberec, president and chief executive officer of Empire Airlines; Moloka’i Senator Kalani English, chair of the Committee on Transportation and International Affairs; Stacy Crivello, Maui County council member; Mark Dunkerley, Hawaiian Airlines president and chief executive officer; and Hadden Watt, ‘Ohana by Hawaiian managing director. The festivities also included a lu’au with nearly 500 Moloka’i residents in attendance, live Hawaiian entertainment, tours of the aircraft and a blessing prior to the departure of flight HA 615 to Honolulu. 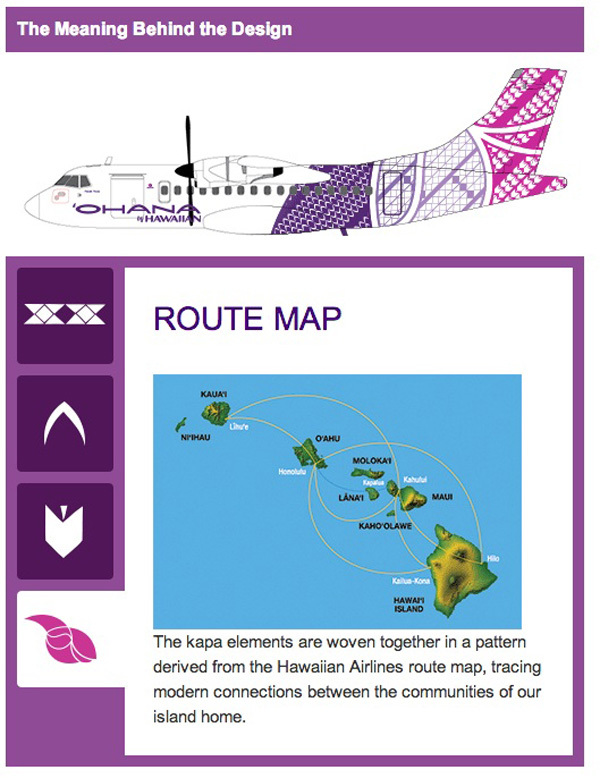 The livery of ‘Ohana by Hawaiian’s aircraft was created by Sig Zane and his son Kuha’o, who both used Hawaiian Airlines’ interisland route map as inspiration for the design, weaving three kapa patterns: piko (navel), representing ancestry and progeny; manu (bird), representing both a bird in flight and the prow of a canoe, the traditional form of migration; and kalo (taro), representing family. 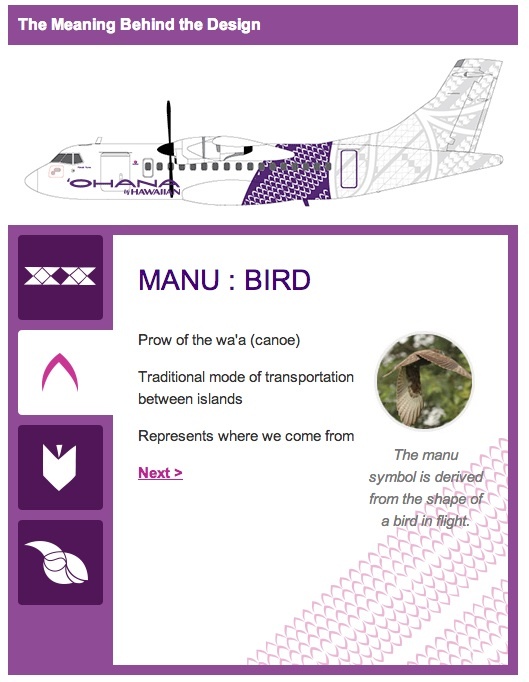 The ATR 42 aircraft are named after a significant wind on each of the islands that ‘Ohana by Hawaiian will serve: Holo Kaomi of Paoma’i, Lana’i; Kaiaulu of Wai’anae, O’ahu; and Hikipua of Halawa, Moloka’i. The ‘Ohana by Hawaiian operation creates more than 100 new Hawai’i-based jobs in various areas of air transportation including pilots, flight attendants and mechanics as well as ground-handling and customer service positions. Hawaiian Airlines handles reservations and sales for the new operation, allowing the interisland flights to integrate seamlessly into Hawaiian Airlines’ well-established route network. The new service operates out of gates 49 and 50 at Honolulu International Airport. Hawaiian Airlines last flew to Moloka’i and Lana’i in 2004, operating on a Boeing 717-200 aircraft. Copyright Photo: Ivan K. Nishimura/Blue Wave Group/AirlinersGallery.com. ‘Ohana by Hawaiian’s N804HC (msn 623) operated by Empire Airlines (Idaho) is pictured starting to taxi out as flight HA 614 to MKK on its first flight. This entry was posted in Empire Airlines (Idaho) (3rd), Ohana by Hawaiian and tagged 623, Empire Airlines (Idaho) (3rd), Hawaiian Airlines, HNL, Honolulu, N804HC, Ohana, Ohana by Hawaiian on March 12, 2014 by Bruce Drum. Hawaiian Airlines (Honolulu) in February 2013 introduced a separate new ‘Ohana by Hawaiian name and brand for its new ATR 42 regional division. Hawaiian Airlines acquired two ATR 42-500s to be operated by Empire Airlines of Idaho. The first, ATR 42-500 N804HC (msn 623) arrived in Honolulu on January 14, 2014. The aircraft have been sitting idle because the AOC certification process with the Federal Aviation Administration (FAA) was held up due to the Washington budget mess called “sequestration”. Now the FAA is working with Empire Airlines and Hawaiian to obtain the Part 121 AOC in order for Empire to operate the aircraft in the islands. According to the Molokai News, the new airline hopes to become airborne next month. 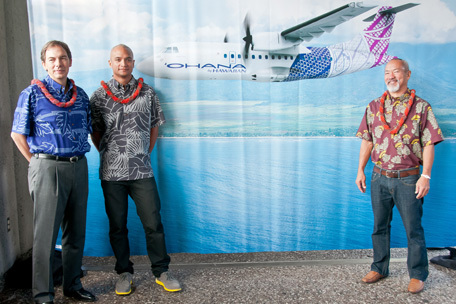 The name and brand identity of the new service, as well as the aircraft design by renowned artist and designer Sig Zane and his son Kuha‘o, were unveiled on February 11, 2013 at Honolulu International Airport. ‘Ohana by Hawaiian will launch daily service to Moloka‘i and Lana’i this summer using 48-seat ATR 42 turboprop aircraft operated by Empire Airlines of Idaho. Copyright Photo: Ivan K. Nishimura/Blue Wave Group. (Left to Right) Hawaiian CEO Mark Dunkerley, livery co-designers Kuha‘o Zane and Sig Zane. Top Image: Hawaiian Airlines: Our fleet of modern, ATR 42 turboprop aircraft evokes some of the magic and nostalgia of a bygone era, soaring along scenic shorelines. 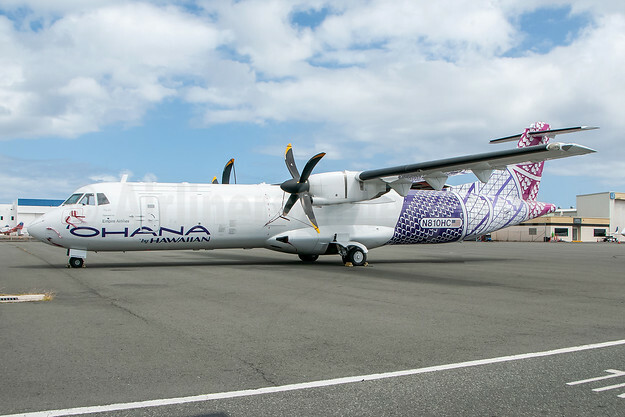 Service aboard ‘Ohana’s 48-passenger twin-turboprop aircraft will feature the friendly, world-class service Hawaiian Airlines is famous for, delivered in a lighter, more casual local style. 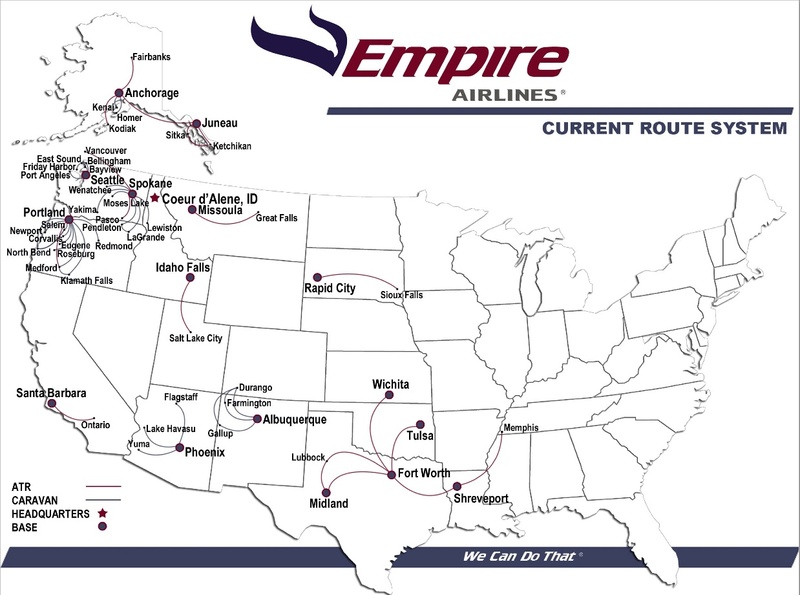 Current route map of Empire Airlines of Idaho: Empire mainly flies packages for FedEx as a FedEx Feeder. This entry was posted in Empire Airlines (Idaho) (3rd), Hawaiian Airlines, Ohana by Hawaiian and tagged ATR, ATR 42, ATR 42-500, Empire Airlines (Idaho) (3rd), Hawaiian Airlines, Ohana by Hawaiian on January 14, 2014 by Bruce Drum. Empire Airlines (Idaho) (3rd) (Coeur d’Alene) will operate the newly-acquired ATR 42-500s for Hawaiian Airlines (Honolulu) according to this report by HNL Rarebirds. Hawaiian has signed a three-year MOU for Empire to operate and maintain the new type. Both N801HC and N804HC are currently at Empire’s base awaiting delivery to the islands. Empire currently operates the type for FedEx Express as a FedEx Feeder. The company started operations in May 1977 as Clearwater Flying Service before changing to the current name in January 1983. This entry was posted in Empire Airlines (Idaho) (3rd), Hawaiian Airlines and tagged aviation, empire airlines, Empire Airlines (Idaho) (3rd), FedEx Express, Hawaiian Airlines, route map, transportation on December 27, 2012 by Bruce Drum.